This article explains how to monitor memory usage in your web application by requesting the MemoryMXBean and exposing collected metrics within a Primefaces LineChart component in a JSF page. The LineChart component calls every minute the MonitorController instance. The MonitorController instance requests the MemoryMXBean instance to get the current memory usage. 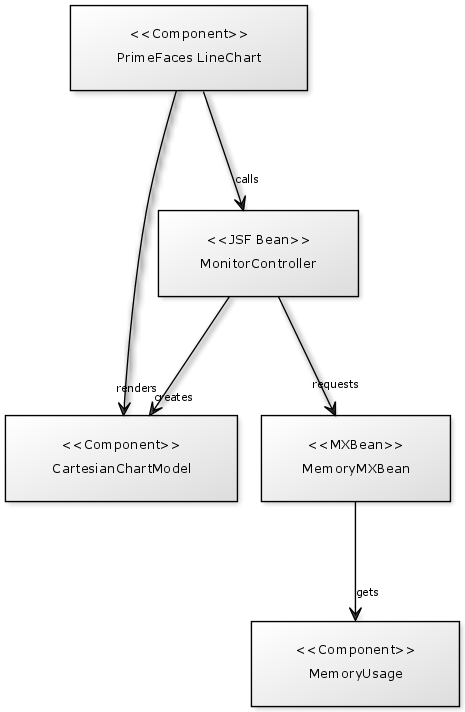 The MonitorController instance updates a CartesianChartModel instance by adding a memory usage snapshot. The CartesianChartModel instance is returned to the LineChart component that renders it inside a JSF page. * JSF Managed Bean to get JVM memory usage. * instantiates a new monitoring controller. * initializes memory usage model. * component. The LineChart component should call this method every minute. Notice that it is possible to zoom with drag and drop, if you have a lot of points displayed. As you can see, it is quite easy to monitor the JVM and to display collected metrics within a JSF page. You can go further by monitoring CPU usage for instance, or by adding some features like starting/stopping/resetting the monitoring. This is an awesome post.Really very informative and creative contents.This concept is a good way to enhance the knowledge. Thanks a lot for sharing this page. Really helpful. piercing might not provide a great electrical connection because of the fistula that forms around the anchor. I've considered bench tests with hypodermic needles to assess the efficacy of transdermal electrodes, but that still won't shed any light on what effect the healing process might have.